So your about to visit Edinburgh, camera in hand and ready to go. What are the must have shots to take home? Depends on your viewpoint really but for any tourist, there are a few must haves to take home to impress your friend and relatives. What follows is a personal top 10 of the classic Edinburgh shots, there are millions more to be had but these for me are my personal favourite “postcard” shots. 1. Calton Hill, the Dugald Stewart Monument and the city. A no brainer this one. Surely one of the most iconic views Edinburgh has to offer. Stand up on the hillside by the old Observatory, from the corner the right spot will be obvious. Some people take it from further back with the Dugald Stewart Monument on the right of the shot; this is my preferred take on it. Get your position right and you can get the monument, Balmoral Clock and Castle positioned perfectly. Works well on a nice day with blue sky, sunset or even in the dark with a nice long exposure. 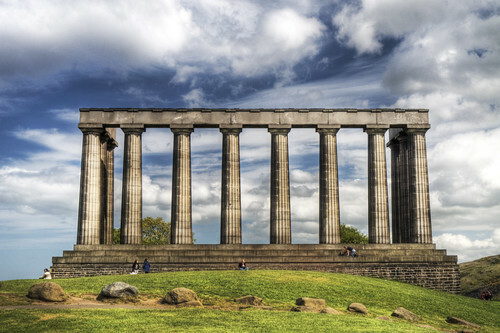 While you’re up on Calton Hill you might as well get the National Monument while you’re there. Hard to miss, the best shot is straight on to the structure. Of course you can shoot if from all angles but straight on is the best for me. If the weather’s not the best you might luck out and get nobody posing for pictures on it, otherwise you’ll have to live with the tourists in the shot. Not always bad as it gives a nice sense of the size of the monument. The monument is lit up at night so opportunities for a night shot here as well. Just be careful up on the hill at night, not always the best place to be alone with expensive camera gear in the dark. 3rd shot on Calton Hill. From the foot of the Nelson Monument, over the railings there is a classic view straight down Princes Street. With a reasonable zoom lens you can keep in the Balmoral Clock and look right down the length of the famous street. This shot works especially well at night with light trails along the road. 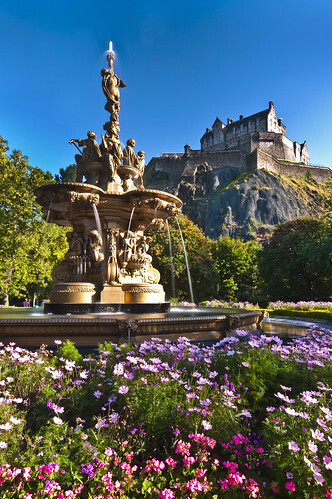 Found on the western edge of West Princes Street Gardens is the magnificent gold Ross Fountain. In summer, it’ll be surrounded by busts of colour with the flowers around it and the water will hopefully be turned on too. Position yourself right and with a reasonably wide lens you can get the fountain, flowers and Edinburgh Castle rising up behind it. Another iconic view of the city, especially good on a nice clear day. The Gardens do shut overnight so opportunities for sunset and sunrise are limited here; check the sun position to with SunCalc, the sun positioned to your right gives the best light on both the Castle and fountain. Found at South Queensferry, roughly 12 miles from the city centre is surely the world’s most recognisable bridge? 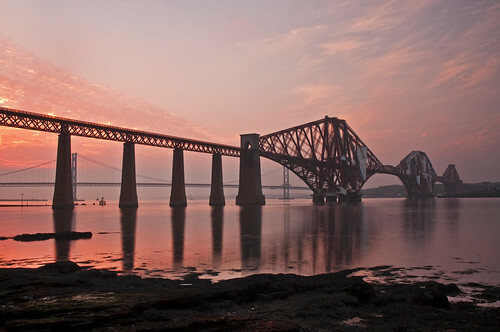 The Forth Rail Bridge is a 3 span cantilever rail bridge and probably Edinburgh’s most recognisable structure. There’s no bad time or weather condition to shoot this bridge. Day, night, sunrise, sunset, rain, shine or snow, you’ll always get something different. Head down the little lane to the right of the bridge and you’ll come to a perfect spot to get it at sunset. 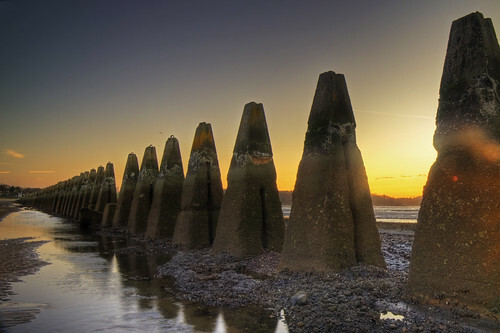 Out to the west of the city before you come to the Forth Bridges is the village of Cramond. Sitting on the mouth of the River Almond is most famous for its Island and causeway which can be walked at low tide. Lining the Causeway are huge concrete spikes which are actually WW2 submarine defences. Chances of a good shot here are endless but looking down the causeway to the Island is always a winner. Just be sure to check tide times if you attempt a crossing, it’s further than it looks. There are 3 options here depending on how fit you are. If your feeling up to it, go right to the top, be warned, it’s not that easy going though. Other options are to the top of Salisbury Crags or even better, from the Crags base up on the Radical Road. The Radical Road runs from Holyrood climbing steeply up around the base of the Crags cliff face. Coming in from the other side of the road near the Commonwealth Pool is a much less steep climb. From up here you can get one of the most breathtaking cityscapes you’ll get from anywhere in the world. Sunset is good here in late autumn, winter or spring as the sun comes down behind the Castle but on a sunny day the view is equally as awe inspiring. OK, so we’ve been up Arthur’s Seat but where’s the best place to photograph Arthur’s Seat from? 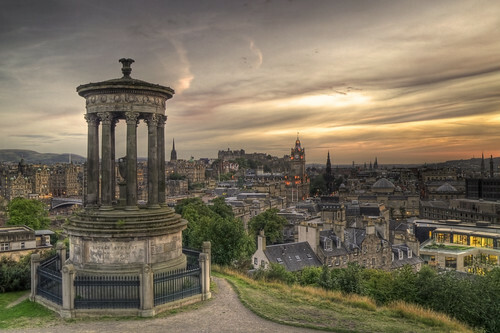 Calton Hill is one choice; personally I’d go a little further out and do it from the slopes of Blackford Hill out to the South of the city centre. From up here you can get the whole classic profile of both Arthur’s Seat and Salisbury Crags. Add to that the bonus of the views over the city and it’s a winner of a location. 3 classic Edinburgh Landmarks in one easy shot. Walk up the side of the National Gallery from Princes Street and you’ll see the shot. Looking over East Princes Street Gardens you’ll get a decent view of all 3 from this slightly elevated position. 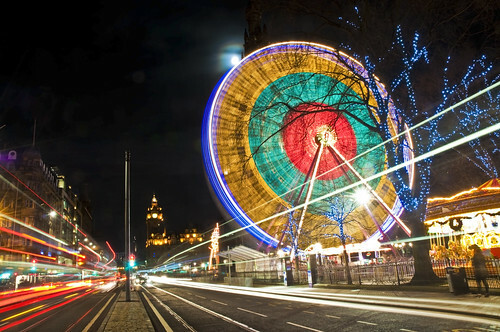 Princes Street is dominated every December by the arrival of the Big Wheel. Part of the city’s Christmas hoo-ha, the wheel sits next to the Scott Monument and with the arrival of the dark nights it’s a perfect place for a colourful Edinburgh at Christmas shot. In Princes Street look east towards Calton Hill, position yourself just before the wheel, with a camera on a tripod on the island in the middle of Princes Street. Wait for buses and general traffic to start moving and fire the shutter for around 20s. A perfect shot, and there can hardly be a photographer in Edinburgh who hasn’t done it. So 10 fairly well known shots down, now it’s time for something a little more out the way. Found at the top end of Harrison Park in the Harrison/Ashley area of Edinburgh is Ashley Boathouse. Sitting on the Union Canal around 1 mile from its start point at the Lochrin Basin the boathouse is one of the most photogenic locations in the city. Get here with a nice late evening golden light and you’re onto a winner especially if there’s a nice calm water surface. So there you have my personal top 10. I’m sure many won’t agree and yes, I have left out a few of the obvious shots. Looking down Advocates Close from the Royal Mile to the Scott Monument has been omitted as the close behind is covered in scaffolding at the moment ruining the shot. I’ve left out anything from the Castle, top of Scott Monument or top of the Nelson Monument as these are all paying locations. Feel free to add your own classics in the comments below! This entry was posted on October 4, 2010 by Grant. 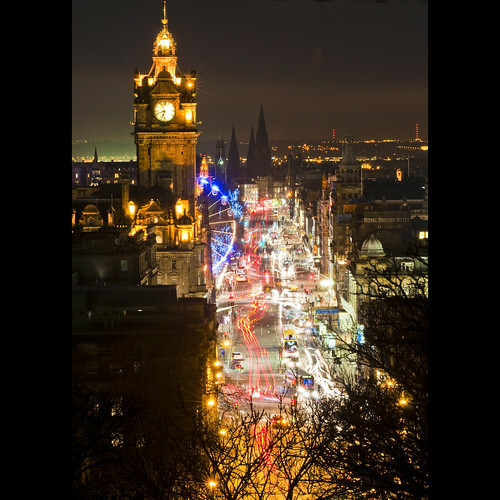 It was filed under Tips and was tagged with arthurs seat, balmoral clock, blackford hill, calton hill, edinburgh, edinburgh castle, north bridge, photographs, princes street, princes street gardens, salisbury crags, scotland, scott monument, tips. Agree with your choices. The shots that can be had from the 7th floor museum are also excellent. Edinburgh is beautiful from any angle! Cracking shots of classic edinburgh locations. Find it very hard to disagree with any of your choices – including the polworth boathouse, which is indeed a hidden gem. Excellent, iconic photos of Edinburgh! 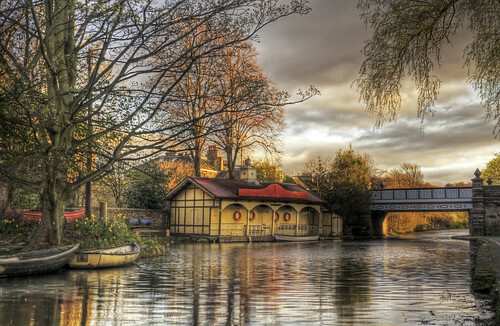 I live about a mile from the Polworth boathouse, but have never ventured that far along the canal – must go this weekend, it looks beautiful. Another great place is Craiglockhart Hill (Napier University Campus), the hill gives great views of central areas, Arthur’s Seat and, well, basically everywhere! In shadow of the Pentlands and (just) in view of the Forth Bridges it is my personal favorite spot! Also, families of badgers, foxes, nests of rabbits, owls and buzzard/osprey nests make great chances! BE FAST THOUGH as it is getting attacked soon by workers and builders for the extension and re-building of the entire place basically. It isn’t somewhere you would think of, but i love it there. It’s a shame seeing how attractive the Ross fountain was like in its prime and then seeing how it is now!